Jackson, Mississippi isn't known as a culinary mecca unless all you are looking for is fried seafood, fried chicken, and homestyle Southern food in general. There's nothing wrong with Southern food at all - it's DELICIOUS! But I travel a lot, and being one from the South myself (NC), it's not usually the first thing I seek out when looking for a good spot for lunch or dinner. So why not see if Jackson has a good French Dip somewhere? I searched on Yelp, UrbanSpoon, Google, and more, and came up empty handed. I felt my search for a French Dip in this city was all for naught. There are a few restaurants making a change from the regular Southern fried fare in Jackson, though. New entrepreneurs and chefs are opening some adventurous (for Jackson) restaurants, and are hitting the nail on the head. I must first give compliments to the restaurant Parlor Market, which gave me one of the best meals I've ever had (literally, ever), though not a French Dip. This is a restaurant that could easily fit in the Meat Packing District in NYC and be packed every night. But even after the great meal I had there, I was convinced there had to be a joint somewhere offering a good French Dip. "I felt my search for a French Dip in this city was all for naught." I'd been searching for dinner spots, and continued to come up with nothing. So while in town, I needed a spot to grab lunch before a meeting. Low and behold, there was a joint with a French Dip - but only for lunch, which is why it hadn't turned up on my radar in my previous searches. The Manship Woodfired Kitchen has nothing to do with being a man - Manship Road is just the name of the road on which it's located. It's somewhat of a manly place nonetheless, with over 300 bourbons on the shelf, including the whole line of goods from the Old Rip Van Winkle distillery ($20-$80/shot). But this was lunch and I was about to meet with a client afterwards, so I did not partake in a slowly sipped glass of Pappy Van Winkle bourbon (mmmmmm....). "I was there for one thing, after all. The French Dip." I was there for one thing, after all. The French Dip. 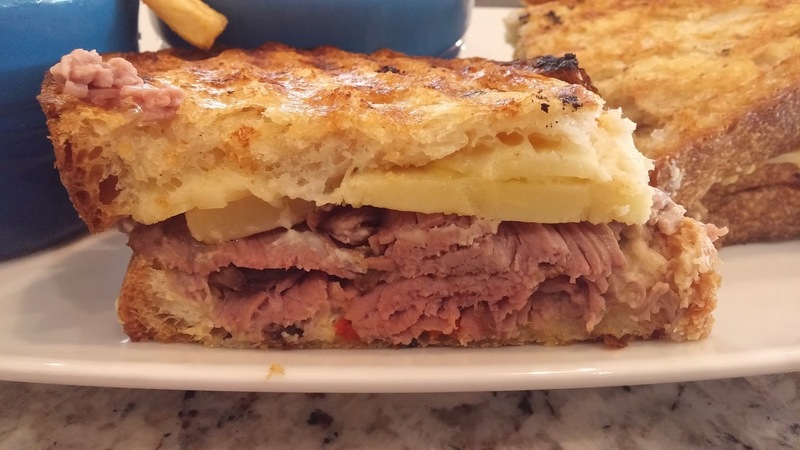 On the lunch menu only, they managed to discreetly place a French Dip titled the "Roast Beef Panini." 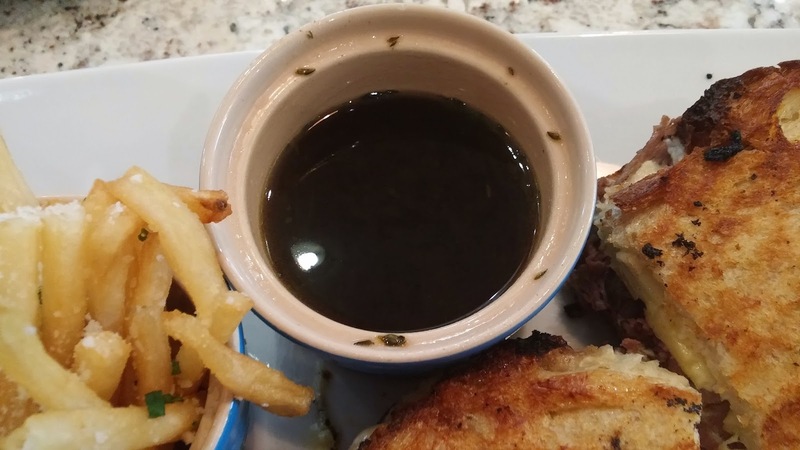 You have to read further into the description to realize that it's a variation on a French Dip and includes au jus for dipping. And at only $12, a no-brainer for me. 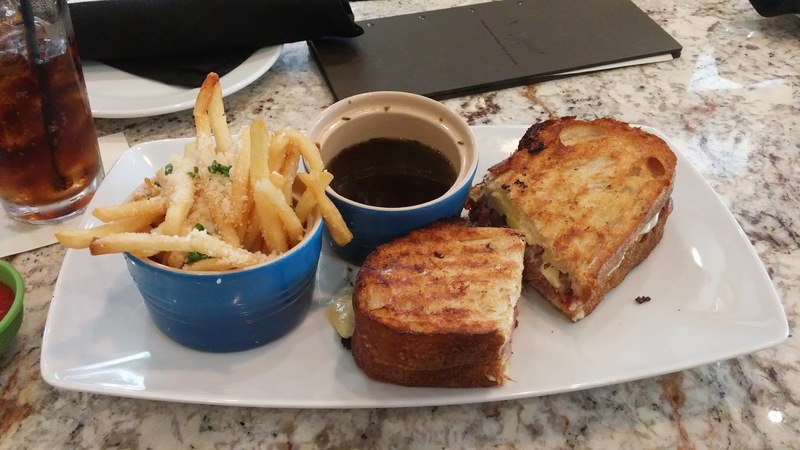 The sandwich comes with red onions, gruyere, horseradish cream, and herb au jus. I'm not one for raw onions, so I forewent that option. But the resulting sandwich was a wonderful take, if not so traditional, on the French Dip. Between the two pieces of pressed, toasted sourdough bread was a healthy portion of medium to medium-rare cooked, tender and flavorful roast beef, cheese, and creamed horseradish with a slight kick. The French Dip with Parmesan Reggiano Fries. The au jus was incredibly flavorful - salty, beefy, but with a much deeper herby flavor than you typically get with a jus. The au jus on the side was minimal. I had to ask for more. If the ramekin was full to begin with, it would have been plentiful. But it was incredibly flavorful - salty, beefy, but with a much deeper herby flavor than you typically get with a jus. The most prominent was the flavor of rosemary, which I've long thought was the best herb to add in au jus when I make a French Dip at home. Tasty (though not plentiful enough) au jus! The crispy, toasted bread was, though not traditional, a nice departure from the norm and certainly didn't hurt the sandwich at all. It may not mean it's a French Dip in the traditional sense, but hey, it's a sandwich with roast beef and au jus. It's a French Dip to me. The sandwich came with parmesan reggiano herb french fries, which I swear were some of the best tasting fries I've ever had. I was picking out the crumbs of herbs and parmesan from the bottom of the bowl after finishing them. I highly recommend checking out The Manship Woodfired Kitchen if you are ever in Jackson. Lunch time is unfortunately the only time that you can get the Roast Beef Panini with au jus, but the menu (and bourbon selection) are strong, even if you feel like a dinner (though it would have to be sans French Dip).